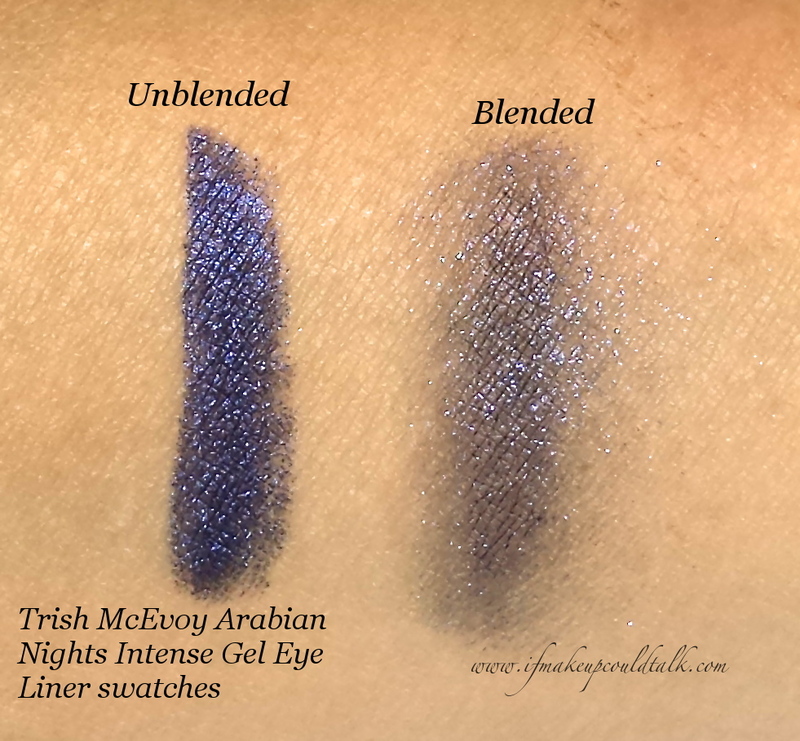 Trish McEvoy Arabian Nights Intense Gel Eye Liner is Exceptional! I have a long-standing love affair with dark blue eyeshadow/liner. 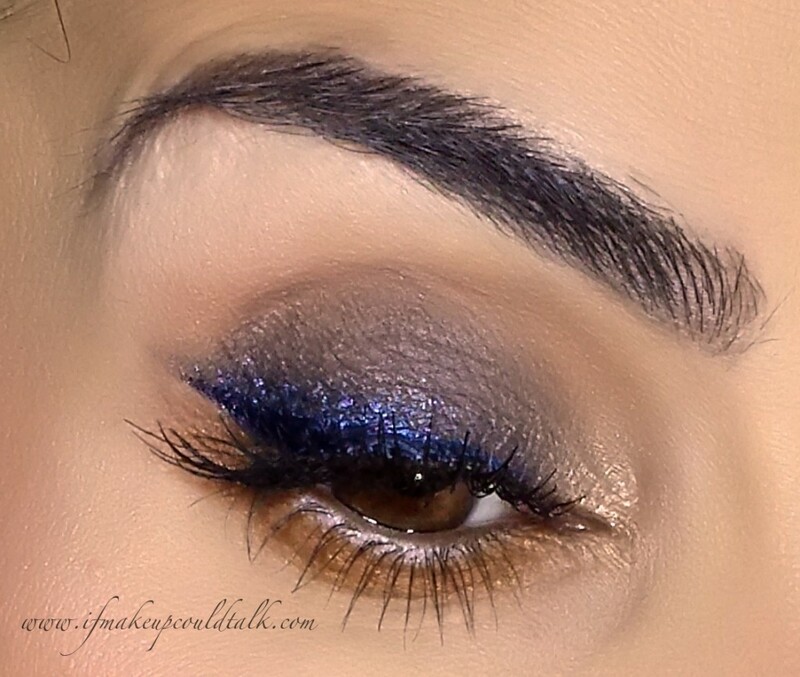 The contrasting cool tones found in blue shadows seem to look particularly striking against brown eyes. 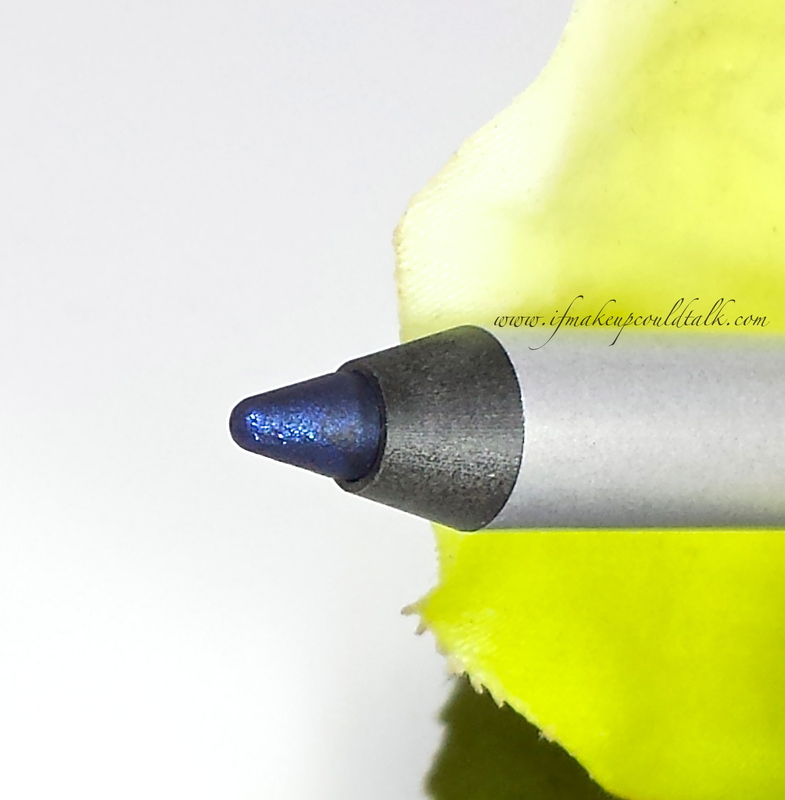 Trish McEvoy Arabian Nights Intense Gel Eye Liner ($28 USD/1.20g) was just the right shade of blue I had been seeking out for the longest time. The rich intense pigment, the smoother than silk texture and glistening blue shimmers seemed too good to be true. In this one instance, I can gladly say, any and all skepticism was put to rest with the first swipe. I hope you enjoy! 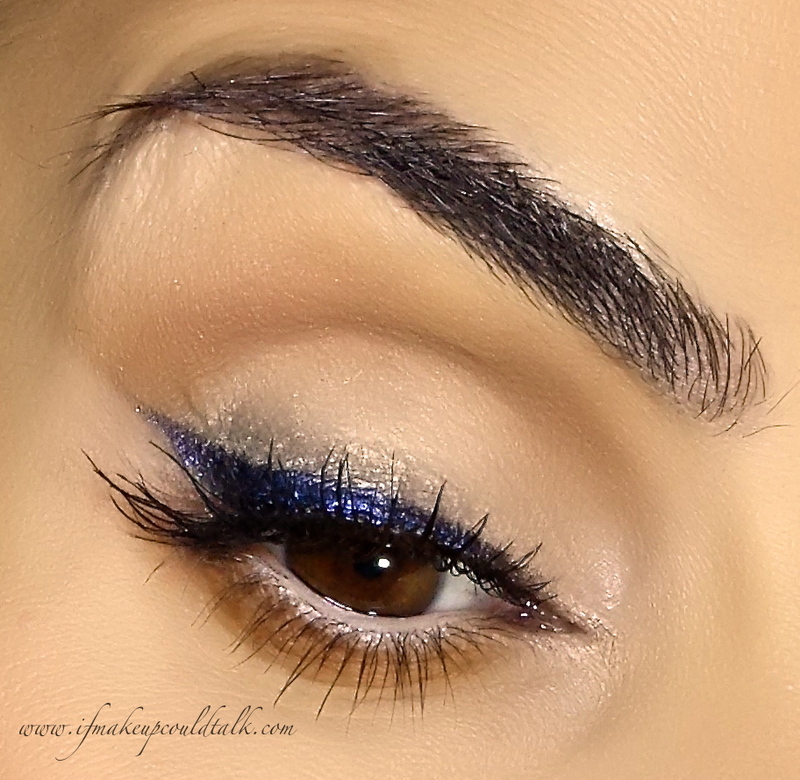 Intense dark blue gel base with an abundance of the finest indigo shimmers. Incredibly smooth texture–shimmers feel completely undetectable. Ideal for everyone–glides on the skin like butter. Pigment transfers seamlessly on an angled brush for more precise application. Color does not transfer, crease, migrate or fade throughout the day. Soft creamy texture can be used as an eyeliner, eyeshadow and on the inner waterline. Can be layered without any patchiness. Formula does not dry immediately making color placement and blending effortless–even over a primer. Once the formula sets (30-45 seconds) it does not budge. Portable pencil design is travel friendly. Trish McEvoy pencil sharpener is included with purchase. Removes easily with my dual action makeup remover. Comes in three colors: Black, Arabian Nights and Deep Aubergine. The sponge tip is too firm and does not blend out the creamy color evenly. Due to the soft nature of this formula, sharpening is often required, resulting in wasted product. A mechanical twist-up design would have been a more befitting option. Quite expensive for the amount offered–*sigh* but, oh so worth it. No other cons–this is one of the best eye liner formulas. 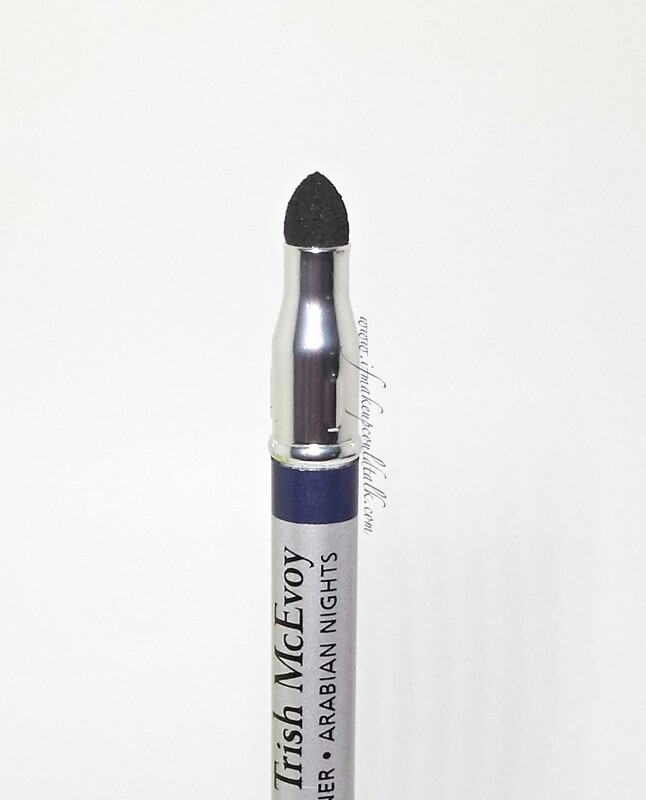 Trish McEvoy Arabian Nights Intense Gel Eye Liner used as a liner on the upper lash line. For the above photo, I used my Rae Morris #16 Angled Brow Definer (reviewed here) brush to apply Arabian Nights on the upper lash line. Using my Billy B #12 brush (reviewed here), I buffed Kjaer Weis Divine Eyeshadow (reviewed here) ever so sightly above Arabian Nights. FYI, I wore this look during a two-hour hike and the color did not budge amid sweating and humid weather. In total, the liner lasted thirteen hours in perfect condition. 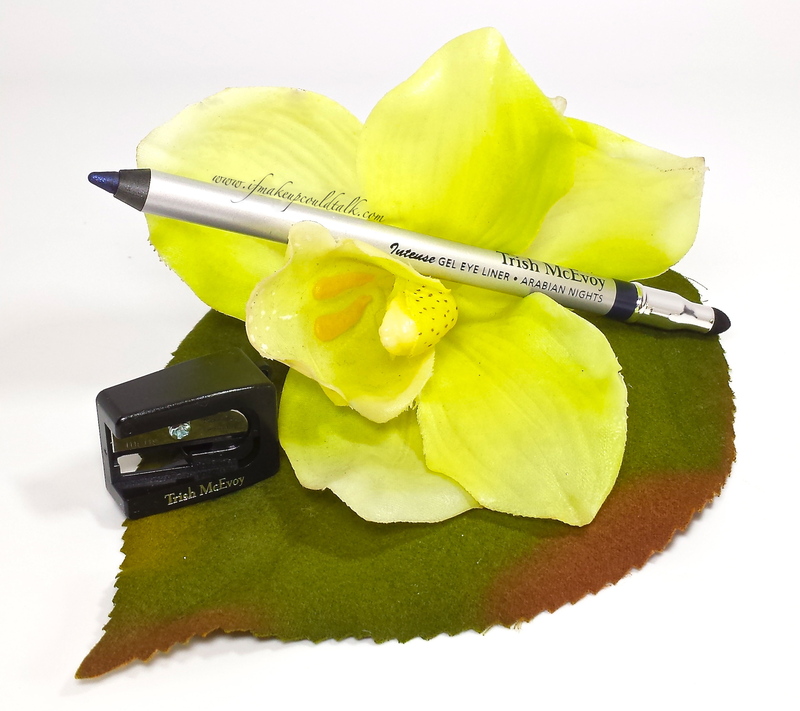 Trish McEvoy Arabian Nights Intense Gel Eye Liner used as a liner paired with a gray shadow. For the above look, I used Giorgio Armani Eye and Brow in #2 Wenge Wood (reviewed here) all over the lid. 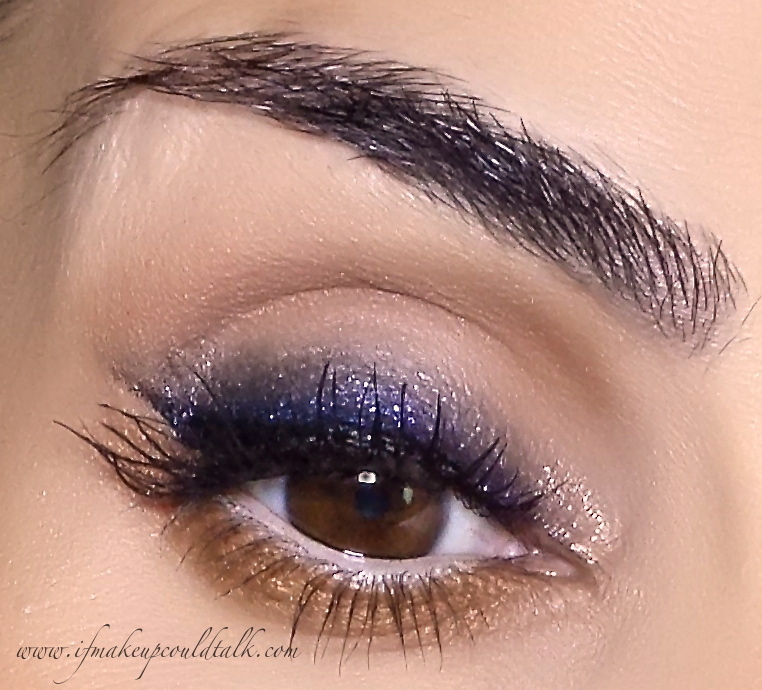 Arabian Nights was applied thickly along the lash line and blended out with my Billy B #12 brush. Rae Morris #16 Brush was then used to create a sharper winged line. If you wondering whether this liner is comparable to any of my eyeshadow sticks, it is not. 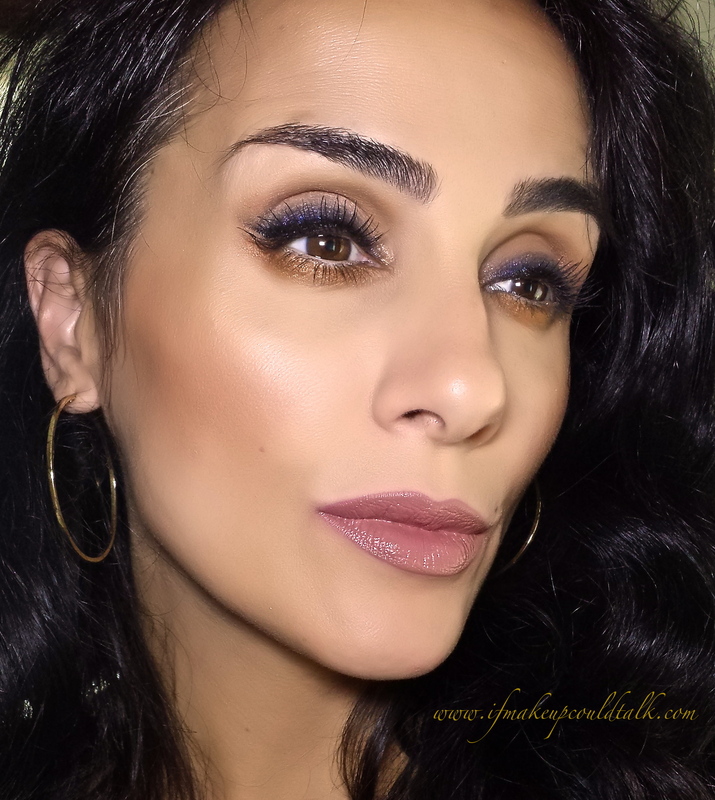 The only common ground is the amazing lasting power; Arabian Nights is smoother, easier to blend (even over dry primers) and more vibrant than any of my Caviar Sticks. Trish McEvoy Arabian Nights Intense Gel Eye Liner smudged and paired with a black liner. For the above look, I used Arabian Nights more like an eyeshadow, applying the color quite heavily along the lash line and blending it out with my Billy B #12 brush. Guerlain black liquid liner was then applied at the base of the lash line for the quintessential winged line. Full face using Trish McEvoy Arabian Nights Intense Gel Eye Liner smudged and paired with a black liner. Iron oxides, mica, titanium dioxide, isododecane, cyclopentasiloxane, peg/ppg-19/19 dimethicone, synthetic wax, hydrogenated polydicyclopentadiene, calcium aluminum borosilicate, nylon-12, c20-40 alcohols, perfluorononyl dimethicone, polyglyceryl-4 diisostearate/polyhydroxystearate/sebacate, silica, polyethylene, pentaerythrityl tetra-di-t-butyl, tin oxide, tocopherol. Makeup would tell you Trish McEvoy Arabian Nights Intense Gel Eye Liner is worth every penny. If you are in the market for a color that glides on the skin like silk, a long-lasting eyeliner formula, a beautiful rich navy blue color with dimension, and a travel friendly liner option, then look no further. I can solemnly swear I’m in love. Personally, the black version is calling my name and will most likely be purchased by week’s end. What can I say, I have no control. 🙂 Until next time, be well, stay safe and be happy. *IfMakeupCouldTalk.com is not affiliated with any brands mentioned, all products were purchased by me. *Compensation is not given for any reviews. *This post contains affiliate store links. *Click on each photo to enlarge. *Click on the rose highlighted words to take you to a direct link to each product. *All opinions are my own and based on my experiences. *All photos are property of IfMakeupCouldtTalk.com unless otherwise noted. *IfMakeupCouldTalk.com photos can only be used for other social media and publications with granted permission.